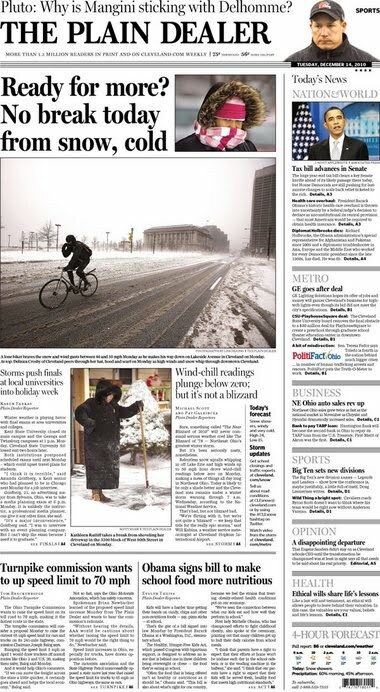 The sight of someone riding what looks like a Bianchi Pista down Lakeside caught photographer Lisa DeJong's attention and her photo appeared on the front page of The Plain Dealer this morning. A Rocky River customer named Bruce told Scott a great biking-in-the-snow story. 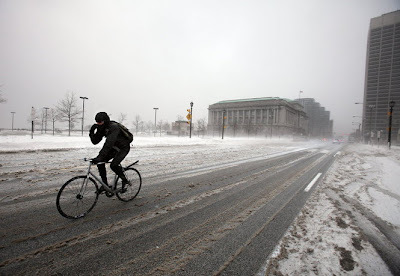 Bruce was one of those downtown office workers who experienced that blizzard last Wednesday -- except he had parked his car in the Flats that morning and biked to his office building. When it was time to leave work and the rest of the city was trapped in a gridlock of cars and busses, Bruce jumped on his bike. His coworkers jeered his snowy ride, until they found out he was at his car in no time flat and was cozy at home on the west side in less than 20 minutes. Winter bicyling for the win! Do you have "winter biking FTW!" story? We'd love to hear it! That's a real story as opposed to those urban 'races' of car vs. bicycle. That's my friend Dan Dominic!